I’m also really happy with how I ate today. 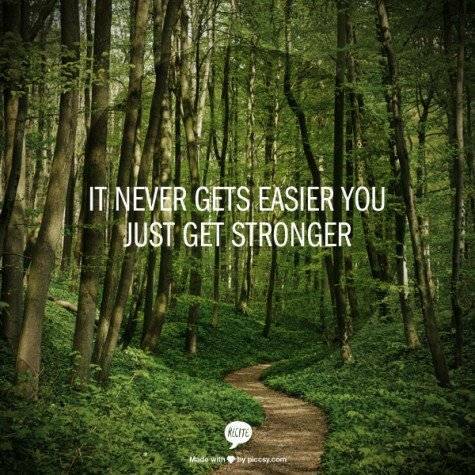 My renewed paleo strictness seemed like a breeze. I had my “breakfast of champions” egg scramble (mushrooms, bell peppers, sun dried tomatoes, spinach–I nixed the goat cheese) before church. Before my run I had a banana, and after I had a smoothie with some almond milk, chocolate protein powder, and spinach. While I was at the store I decided to grab stuff to try a snack I saw on Pinterest–honeydew wrapped in prosciutto. I didn’t know what to expect, but OMG it was so good! New paleo snack fave. 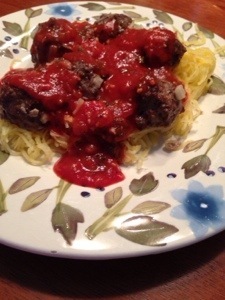 Dinner was paleo spaghetti and meatballs and it turned out AHmazing too! Thank goodness it made plenty of leftovers. I used spaghetti squash for the noodles. Simply cut them in half and bake at 375 for 40 minutes. 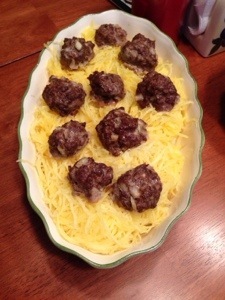 The meatballs were made from the local, grass-fed beef I got yesterday from the co-op. The grass-fed beef really has such a rich flavor it doesn’t even compare to regular ground beef. I seasoned with some onions, garlic powder, salt, pepper, coconut aminos, and smoked paprika (this basically gives a bacon taste without bacon). 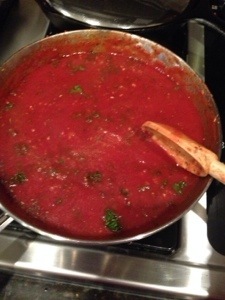 Then I made tomato sauce from organic tomatoes, onions, garlic, fresh basil and parsley, and some oregano. All together it was comfort food crack! While it definitely filled me up, running 7 miles will give you quite the appetite so after dinner I had a few Medjool dates with almond butter, literally the most delicious healthy “dessert” ever.